Paradigm Initiative Nigeria (PIN) is a social enterprise focused on bridging the gap between less privileged Nigerian Youth and Information Communication Technology (ICT) opportunities. As part of its socio-economic development projects, PIN reaches out to students in tertiary institutions by providing them with knowledge useful for developing an ICT-oriented entrepreneurial mindset. The North Central edition of the 2014 Techie.Entrepreneurial.Nigerian.Talented. (T.E.N.T.) workshop was recently held at the University of Ilorin where students from University of Ilorin, Kwara State University and Federal Polytechnic, Offa. The two-day workshop which took place on 17th and 18th September, 2014 provided learning opportunities through presentations and interactive sessions with students who are currently working on tech ideas. The first day of the workshop allowed the facilitators to discuss the need for students to take advantage of the ICT opportunities in the face of growing unemployment. 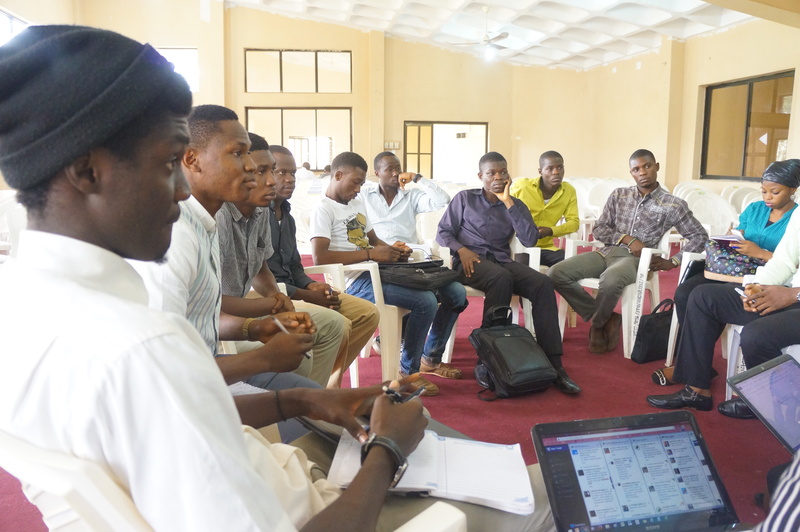 Facilitators at this edition of the 2014 T.E.N.T workshop were Paradigm Initiative Nigeria’s ‘Gbenga Sesan, Olamide Egbayelo (Digital Media Manager) and ‘Debola Agbaje (Project Manager, T.E.N.T./Digital Jobs). Twenty-five students who are currently developing ICT based ideas attended the second day of the workshop, following a selection process on the first day of the workshop. Participants made a presentation on their projects. Some of the projects were: PIN provided feedback and shared support opportunities with the students. This was followed by a students’ peer-review session aimed at evaluating and analyzing each other’s ideas. The North Central edition of PIN’s T.E.N.T. workshop was sponsored by Microsoft. PIN Executive Director, ‘Gbenga Sesan announced that the 2014 edition of the T.E.N.T. Gathering will be hosted by Benson Idahosa University, Benin City from November 18-20. According to him, “the Big Plan on T.E.N.T. is to work with tertiary institutions to become the ICT talent hub for Africa, the same way tertiary institutions in the US Silicon Valley have laid a foundation for technology innovation”. He further emphasised that “the theme of the third annual T.E.N.T. Gathering will be ‘See the Need, Take the Lead’. As usual, T.E.N.T. Gathering participants from across Nigeria will benefit from keynote addresses by leading experts, presentations by techies and entrepreneurs, panel discussion with young start-up founders and the exciting contests- ‘Clash of the Campuses’. This year’s contest promises to be different and attracts mouth-watering prizes. T.E.N.T. seeks to ensure that students graduate with tech businesses or skills and not just CVs. We strongly believe that with students who ‘See the Need’ have a better opportunity to ‘Take the Lead’ in their respective areas of focus”. Paradigm Initiative Nigeria (PIN) and The Rockefeller Foundation, will launch a new #DigitalJobs project at PIN’s new headquarters on October 2, 2014. The project, which is part of Rockefeller’s efforts to impact 1 million lives in 6 African countries, will involve a campaign to introduce the benefits of online jobs and training opportunity for youth who sign up through PIN. PIN, the Rockefeller Foundation and other partners in Nigeria and other African countries have embarked on this new project to help tackle unemployment amongst young Nigerians. This will be achieved by introducing online job opportunities that will allow unemployed youth use their unique skills to meet the needs of those who require them, from all corners of the world. For this, they will be able to earn a decent income while also improving their lives and the socio-economic conditions of their families. The #DigitalJobs campaign will encourage young people to combat the effect of unemployment with their existing skills by leveraging the opportunities presented by online work. Online work training opportunities and associated long term benefits, will encourage young Nigerians to develop relevant 21st century skills or sharpen existing skills that can increase their earning potential. “Every young Nigerian should be able to take full advantage of the new opportunities that online jobs provide” said Adebola Agbaje, PIN’s Program Manager for the project. During the launch event, on the 2nd of October, from 4pm, PIN will provide first-hand information about the online work project, and online work opportunities, at the organisation’s new headquarters located in Yaba, Lagos. The launch event will be attended by project partners, digital jobs/online work experts, and potential online workers. “At the launch event, we will unveil the online destination that will connect young Nigerians with digital jobs, exciting monthly contests and training opportunities at the PIN HQ,” stated Mrs Tope Ogundipe, PIN’s Chief Operating Officer. Paradigm Initiative Nigeria (PIN) is a social enterprise that connects underserved Nigerian youth with Information and Communication Technology (ICT) opportunities; with specific concern about the ill effects of unemployment and cybercrime, among other vices that limit the potential contribution of young Nigerians to the nation’s economy. Having worked with government, civil society, private institutions and international organizations including the United Nations agencies, PIN has worked in ICT education, telecenter support, ICT applications in rural areas, etc. PIN’s projects include Ajegunle.org; Internet Safety, Security and Privacy Initiative for Nigeria (ISSPIN) and Techie.Entrepreneurial.Nigerian.Talented (TENT). PIN opened an ICT Policy Office in the Nigerian capital city of Abuja, in April 2013, to focus on Internet Freedom and other ICT Policy-related issues. Over the next year, PIN’s Ajegunle L.I.F.E. program will be extended to locations in North East and South East Nigeria.